James the rolling turtle was rolling down the road, feeling sad because he had no owner. He bumped into his best friend, an old man called Larry. Larry was annoyed at first, but then realised it was James. “Can I please have some money for lunch?” asked Larry. “Sorry I don’t have any money,” said James. “No! There are bear-sharks in the water,” James replied. Larry had never heard of bear-sharks and wasn’t sure they were real. “You don’t have to go in the water,” he said. On the way to the beach, James found a 50 euro note. He thought it was food, so he ate it. Larry shouted, “What did you do that for?! “Sorry – it was really yummy,” James said. 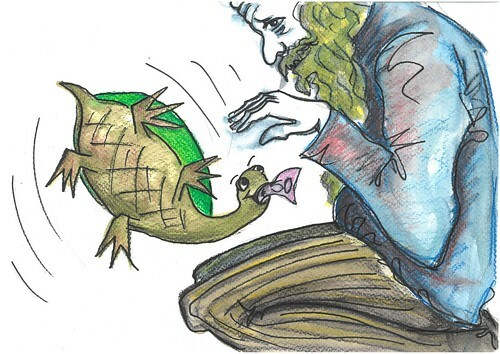 James was really sorry for eating the money, so he offered to catch some fish for Larry’s lunch. While he was out swimming, he spotted an enormous sunfish. 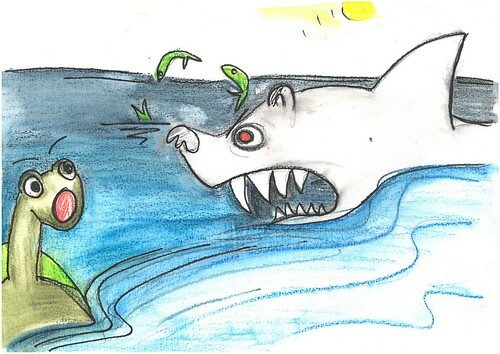 But little did he know that a bear-shark had spotted the fish as well. From the shore, Larry saw the bear-shark and realised they were real.